Well, here’s a great idea. 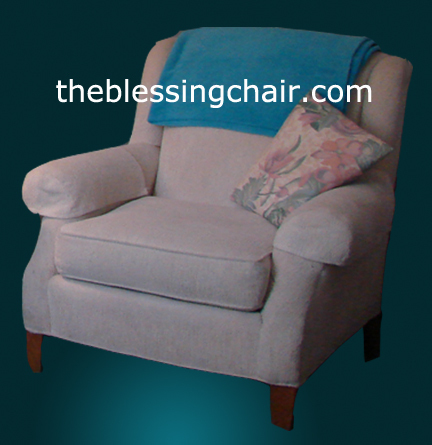 Let’s create a beautiful Blessing Chair for ourselves. Yes, I have created mine as a physical thing but you can create a virtual one for yourself that can take you anywhere to experience all that you believe is possible. Find a quiet place. Again this can be physical or imagined. Gather some pillows to comfortably support yourself. One under the knees is good and one under the head or base of the skull. Whatever feels ‘right’ for you. What we are going for is a relaxed, supported neutral feeling. A recliner works well. Take your time with this, when you are physically comfortable you should feel like you are floating. Place an eye pillow over your eyes or imagine that you are in complete darkness, a quiet, neutral, supportive space. You can play beautiful music to support the feeling. Choose music without words, music that is bi-neural is especially good. Bi-neural music stimulates both sides of the brain creating elevated consciousness, very cool stuff. As you close your eyes begin by imagining a large black board and a large eraser. We all have persistent thoughts, now is the time to take your eraser and with large sweeping stokes, erase the chatter from your mental board. When you are satisfied that your visual board is clear, invite in the reality that holds your chosen desire. It can be anything. It can be something you want to see come to pass in the physical. It can be blessings for yourself personally or it can be blessings for global ideas. Whatever it is, just know that you are the artist, the creator and just like painting with actual paint you are creating a landscape that holds your vision. Some may think that this is quite abstract but as we expand into the possible, we become the designer of the dream. I imagine myself picking up the brush. Whatever your dream may be, it can be experienced as a NOW event. Take this into consideration before you choose your course. As always, enjoy the ride.